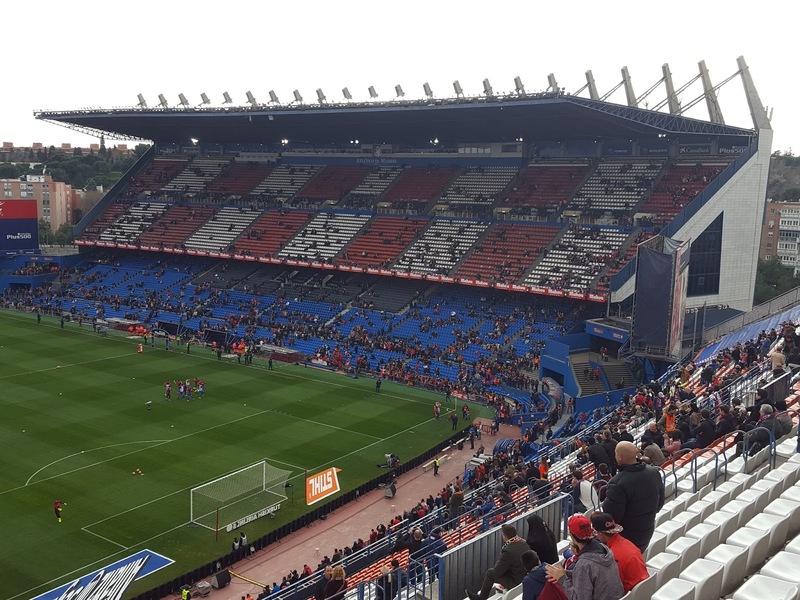 My fourth ground of 2017 was on Sunday 5th March at the Estadio Vicente Calderón in Arganzuela, Madrid, Spain. The match was Atlético Madrid vs. Valencia in Spanish La Liga. 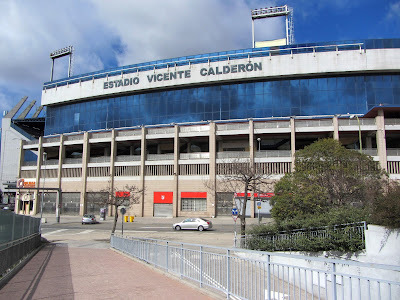 The Estadio Vicente Calderón was to the south-west of the city centre on the banks of the Río Manzanares close to the Río Madrid park complex. There were two metro stations nearby - half a mile to the north-east was Pirámides station while half a mile to the south-east was Marqués de Vadillo station. Both of these are on Line 5 of the Madrid Metro. The venue became home to the club in 1966 when they moved away from the Estadio Metropolitano de Madrid. 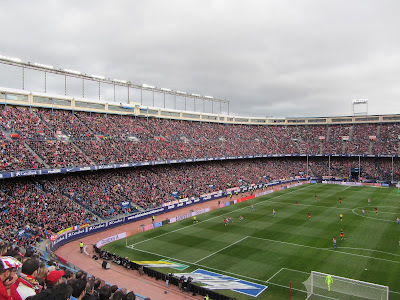 In 2017 Atlético departed the Estadio Vicente Calderón in favour of a new 68,000 capacity Wanda Metropolitano in the north-east of the city. 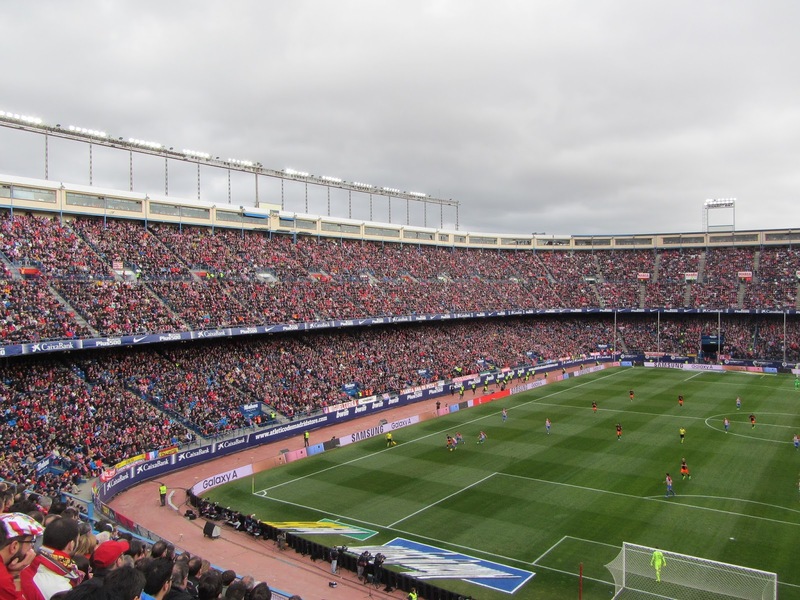 The Estadio Vicente Calderón had an overall capacity of 54,907 and three-quarters of the ground were made up of a two-tier bowl which extended round the northern, eastern and southern sides of the ground. The seating in the bowl section of the stadium was uncovered except for a small proportion of seats at the back of the lower tier, which were covered by the tier above, and three rows at the back of the top tier which were covered by the corporate boxes perched on top of the seating the whole way round the bowl. The lower tier behind the southern goal housed the loudest home fans in the ground. In terms of the exterior of the stadium the eastern side had a club shop, club museum and the 1903 sports bar and restaurant while the northern side was home to the media centre. The western stand was not connected to the bowl and was a very unusual structure in that it overhung the M30 motorway with five lanes of traffic running directly beneath it. This allowed it to run up to the edge of the river while being suspended far above it. The cantilever roof covered all of the top tier and the upper areas of the lower tier. At the front of the lower tier were the dugouts and players tunnel which led up to the pitch from the depths of the stand. A small amount of seating in the lower tier extended round into the south-west and north-west quadrants and there were two big screens behind this seating which bookended the western stand. 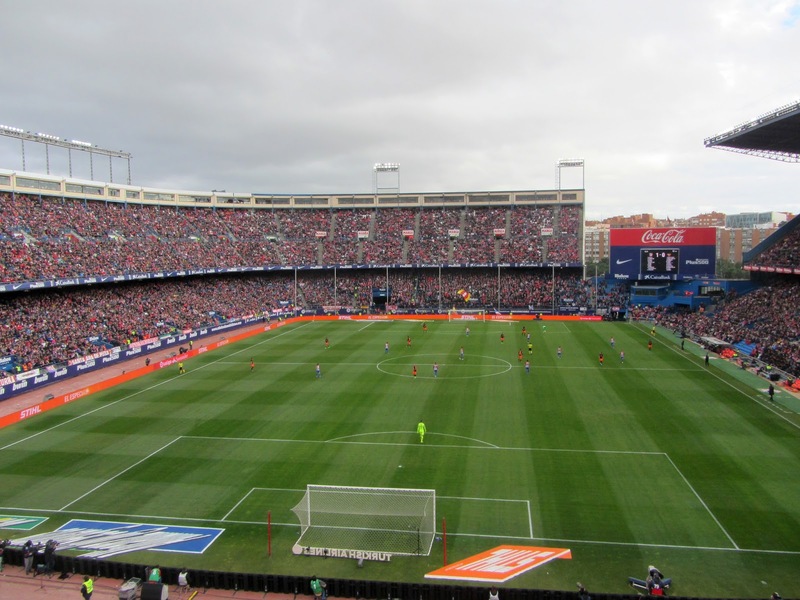 Atlético played some excellent football in the early stages and dominated the first quarter of the match. It only took until the 10th minute for the hosts to go in front as a crisp passing move from the back culminated in Koke stroking the ball through the Valencia defence to Antoine Griezmann who shot across goal into the bottom corner from 15 yards out. After the opening 20 minutes Valencia managed to frustrate Atlético while not offering much themselves. This served them well until just after the second half restarted when they found themselves 2-0 down. It came about when Filipe Luis sprinted towards the box before laying the ball off to Kevin Gameiro. He then shot from 20 yards and the ball deflected off a visiting defender and into the far corner of the net. A few minutes after this the hosts should have extended their lead when Griezmann was put through on goal but his shot was pushed just past the post by the Valencia keeper. In the 59th minute the home side had another good chance when a terrible lobbed backpass put Gameiro in on goal but he was tackled by a returning defender as he was about to shoot. Valencia presented another opportunity in the 69th minute when a misjudged pass put Gameiro in on goal but he dragged his shot well wide. Just 60 seconds later another sloppy back pass set-up Griezmann but once again the home side failed to make Valencia pay for their errors as he lofted the ball over the bar. The home side did get a third goal in the end - a pass into Thomas Partey was miscontrolled by the Ghanaian but this error actually ended up being a perfect pass for Griezmann who reacted quickly to poke the ball past the keeper. In injury time Atlético came close to adding a fourth when Nicolas Gaitan cut in well from the wing and shot just over from close range as Valencia defenders closed in on him. Valencia came away fairly fortunate to have only lost by three goals with their side offering very little to give their travelling supporters any cheer.